Both items are constructed of heavy duty 7/8" solid shaft on horizontal bottom bars and 1/2" solid shaft rods on vertical members with 1 inch center vertical bar. 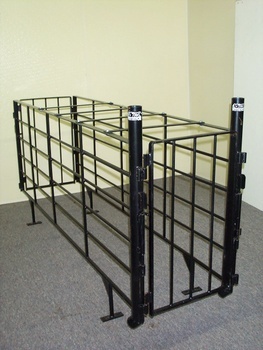 Top bars are built with durable 1/4 x 1 1/2 inch flat iron on each end, and 1/4 inch x 1 1/2 inch flat iron for horizontal top bars. Front and rear legs are 1 inch solid shaft and are reinforced. Comes complete with 2 inch feed tube. 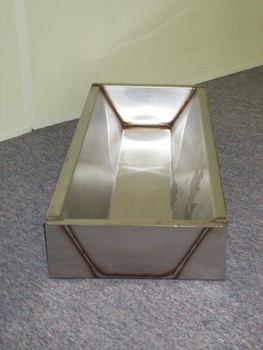 Stainless steel feed trough available as an option. Gestation stall shown above measures 7 feet long, is 41 inches tall, and may be adjusted in width from 19 to 24 inches. It features a sloping back. 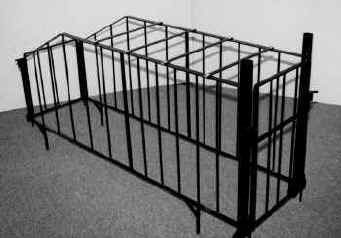 Boar pen measures 7 feet, 3 inches long, 45 inches tall, and 24 inches wide, and has level construction on top of crate. This pen is reinforced in all four corners with solid steel bracing for maximum structure life. 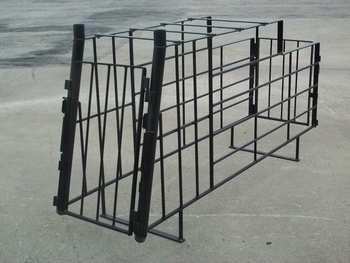 Vertical gating for breeding pens available as an additional option. Both pens feature the quick latch, our easy-opening system. One handed operation is simple to use and will not pinch.